Analog Artist Digital World: In the East Village of NYC. I was asked to teach an Urban Sketching Workshop in NYC. The hotel was located in the East Village which has changed quite a bit since I lived in NYC close to 25 years ago. Hip new bars and eateries proliferate the neighborhood. When I got to this street corner of Clinton and Houston the age old feeling of the city returned. I took the time to sit on a bench in the middle of the intersection and sketch the neighborhood. I imagined myself living in that cylinder shaped corner tower on the corner on the top floor. From there I could see the bustling city life as I painted in the studio. I went to college in the city and wish I had the patience and perseverance to sketch the scene as I can today. A homeless man on the far corner to my left was begging the entire time I sketches. His mantra for a dime became the soundtrack for the scene as I worked. It was a rather crisp day which I am not used to, so I had to put on my gloves to keep sketching. Direct sunlight helped when it struck my hands. The sketch workshop went well. We did quick studies while e were gathered in a dance studio which had mirrors on the walls. 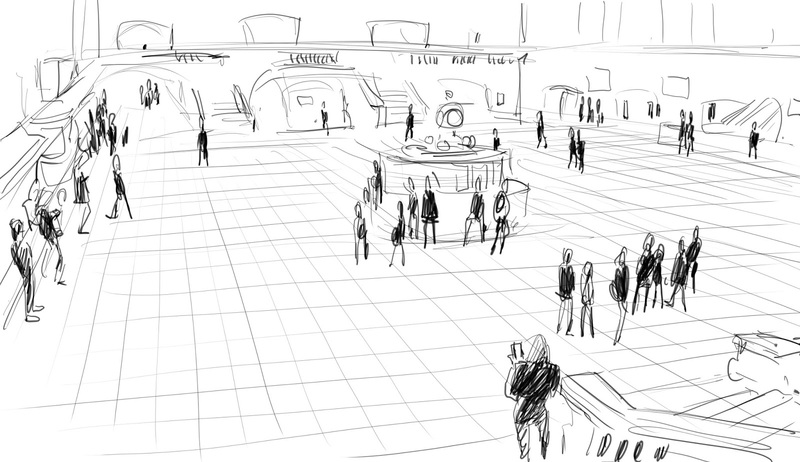 Mirrored walls are perfect for showing where a vanishing point is in a scene. For the second part of the workshop, we went to Grand Central Station. I wanted my crew of artists to see the main floor from the second level. We walked up the steps and overlooked the expanse. The amazing this is that the second floor of Grand Central Station is now exclusively an Apple Store. Phones and iPads were everywhere. The store staff didn't seem to mind us leaning against the marble railings and sketching. After sketching at Grand Central, we all went to a German pub for drinks and to share sketches. 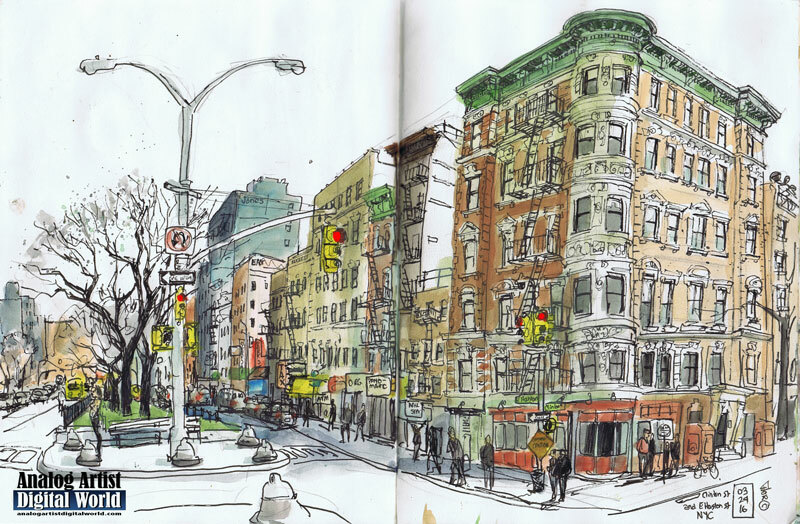 The New York City Urban Sketching community is vibrant and exciting. I kind of miss being in the city that never sleeps.